When I make my turkey I start with a roaster full of chopped carrots, celery and onions as a cushion under the bird. Then I throw in a bag of cranberries, the heart, liver, gizzard and a stick of butter that has been cut into several pieces. To that I add 3 cups of homemade chicken broth. I stick another stick of butter in the bird's cavity, salt and pepper the bird really well and tent foil it. I don't uncover it again until 20-30 minutes before it should be done. I baste it every 10 minutes until crisp. The result is the juiciest and tastiest turkey you ever did eat. Now while hubby is carving the turkey, I start the gravy. By the time the turkey is done the vegetables have turned to mush which is fine by me. If they haven't, I puree them in the food processor until they are. The cranberries add a bit of tart to the gravy that we like. This makes enough gravy for hubby and I for several days as well as 4-4 cup portions for the freezer. Eventually I have nothing left but the carcass and crisp skin and start the broth process. I use a large stock pot and cover the carcass with water. I let it boil for about an hour and it creates the tastiest broth. I strain the broth in batches. This year I ended up with 9-4 cup portions of broth for the freezer. YAY! We have lots of soup base! All in all my $25 turkey has provided us with the basis for about 15 meals bringing me in way under budget! TIP: If you ever have the opportunity to get these Tupperware labels, they are awesome. They stick in the freezer, peel off easily and are inexpensive. They are a great way to keep the "freezer mystery surprise" out of your freezer and stay organized too. 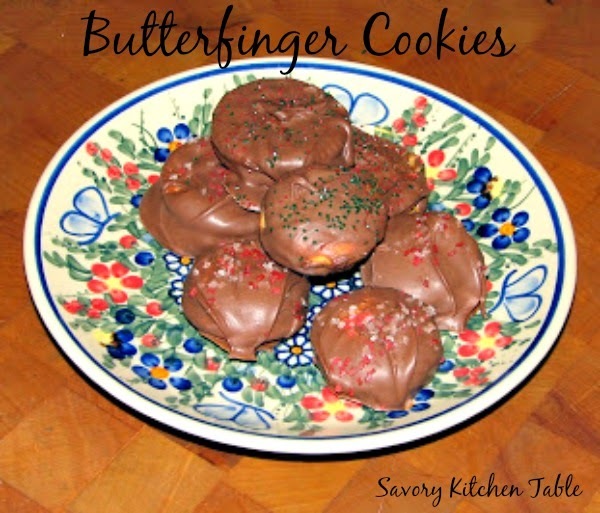 While the broth was boiling I made these awesome and SUPER EASY Butterfinger cookies and some strawberry ones too.